Today I would like for you to meet Abby McDonald. She is a lovely person that I have grown to admire and respect. Her words minister to my soul. I’m thrilled that Abby is our guest writer today. The longer we sat, the more frustrated my son became. My tiredness came through in my tone and I fought my desire to take the book away from him and finish the reading myself. He slowly mouthed each consonant and vowel of the next word. Then he came to a more difficult sentence and his impatience mounted again. “What’s this word, Mama?” he asked with his long eyelashes batting up toward me. He knew exactly how to break me. He grunted and turned his face back toward the book. I wondered how long we’d been sitting there. Every night since my oldest son was an infant, we’d engaged in this ritual. The bedtime story. Only recently, the role of reading had gone from Daddy and me to child. It was a beautiful transition. But it was also quite exasperating at times. My son was used to things coming easily and without much effort, but reading required hard work and persistence. And five-year-olds aren’t big fans of either. As a mom, I often want to step in and do the work for my kids. Rather than see them struggle, I long to take the easy route and come to their rescue. However, doing so does not help anyone, least of all my kids. 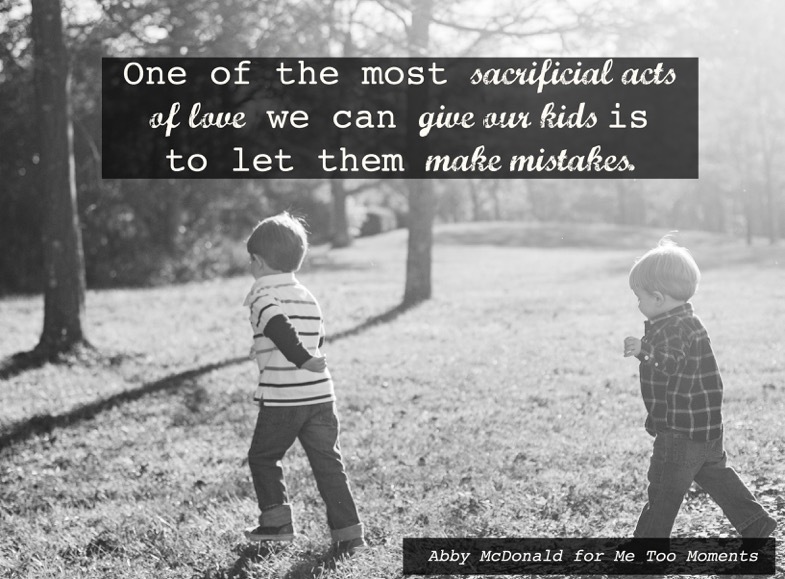 One of the most sacrificial acts of love we give our kids is to let them make mistakes. We let them try, fail, and sometimes fail again. Then we push them to pick themselves back up and try harder. Story time taught me to let go and watch my child soar. When we finally made it through the bedtime story, I could see the satisfaction on my son’s face. Despite all of his complaining and moaning, he’d done it. A smile of pride enveloped his face. I wished I could say after that evening, making him do the work was never a fight, but I’d be lying. For a while, the struggle continued. Now, nearly two years later, his teacher tells me he’s the best reader in the class. Over a parent-teacher conference she recalls how dynamically he reads to the class during story time, complete with voices for each character. No other child in his class does this, but mine does. After hearing his teacher praise him, it was my turn to smile from ear to ear, and I knew all of those nights on the sofa were worth it. Sometimes when we go through rituals such as bedtime stories with our kids, we wonder if it’s making a difference. We may not see the results we desire and get discouraged when our children don’t appear to be learning what we are trying to enforce. Can I tell you something? Will you lean in close and let me wrap my arm around your shoulder? Stay the course, my friend. When you least expect it, your children will recount all of the lessons and learning you’ve been pouring into them. And when they do, simply lift up your eyes and thank God for giving them to you. Beautiful story, Abby! I grinned with you when I read how skilled your son is at reading. 🙂 With teenagers, it’s still difficult to let them make mistakes, but essential! When they figure it out and turn things around … We smile and thank the Lord that He continues to work in their lives … And we see it’s Him doing the work, and not us. This was a sweet encouragement for me this morning. Oh, I can only imagine how hard it is when they become teenagers. 😉 It is so encouraging to hear from you how the Lord is working in their lives. Thanks for sharing, Dianne! Hi Dianne, thanks for coming by today!!! I want to really thank you for talking about God here. Giving our kids over to God is truly an act of faith. I trust God and I know He is faithful. He loves my kids more than I ever could. But, I want to do well as a home school teacher. I want them to do well. It is hard to not be in control of everything. And thankfully God is in control and not me. Every little milestone is definitely a moment to stop, soak it in, and praise the Lord. I love making the time to read with our girls. My husband also does a great job. My dad read with my sisters and I e.v.e.r.y. single night, and in doing so created three lifelong learners. Great post!! Yes, I definitely think that dedicating yourself to it makes them want to engage too. It’s so rewarding to watch him pick up a book now and read it himself. Thanks for stopping by, Liz! I love reading to my kids and they love it to0. I have a feeling that my kids will probably love reading too once they get over the hurdle of phonics. I keep telling my son that he is building brain muscles when I encourage him to sounds out words. He rolls his eyes at me. What encouragement sweet Abby. I find it so hard not to jump in. Perhaps it is because I am selfishly impatient. You speak love and truth to my soul (as always). Thank you greatly for this. I am impatient too, Kelly. I am truly a work in progress in this area (and many others). Thank you for your sweet words, friend. Kelly thanks for stopping by today!! I struggle with being selfishly impatient too. I was just reading with my son today and helping him sound out words. He started whining and I rescued him by jumping in too fast. I think it is a little tricky learning the art of teaching young kids to read. I don’t think there is one way. Kids learn so differently. I love Abby’s post, it truly is so encouraging!!!! I was just telling someone that I think it will be harder when they become teens. 😉 Taking it one step at a time. Thank you for visiting today, sweet Kim. Hi Kim thanks for stopping by today!!! Letting our kids make mistakes is so hard. My six year old makes school so difficult for himself. My husband and I keep tying different ways to help him through his anxieties and fears. We work on building his confidence. Some days it feels like nothing is working and his attitude is down in the dumps with I don’t want too or I can’t do it. After fighting and fighting with him day in and day out and bribing him, I have finally realized that I need to let go. I can’t make him. He is making all kinds of mistakes on his work and quizzes. He is learning at such a young age that if he doesn’t practice reading and writing, he will not know the answers. It was hard for me the first few times when I had to tell him he scored very low. He wasn’t happy either. I hope this will help him when he is an adolescent. You “get” it!! So many times we want to jump in and rescue our kids, but allowing them to try and fail and then learn that they can still keep on going – even through failure – is a lifelong learning lesson. Practicing with the small stuff like learning to read will build a strong foundation for when the more challenging experiences in letting them fail present themselves. I wish I could say it gets easier; it doesn’t, but you are off to a great start!! Way to go Mom!! Thanks Bev for coming by today!!! It is a life long learning lesson. Keep on going even through failure. Hi Lisa and Abby, such a timely post! I was ‘challenged’ in this area because my son is much younger than my step-daughter, so he was definitely treated like the baby of the family. As such, I inadvertently did everything for him. It took a lot of prayer, and coaxing from my husband, to allow some life-lessons to happen. (Which is what I blogged about this week!) Blessings, girls! Kristin, I do believe that there will be some other methods I have to try with my youngest. 😉 His personality is so different. Thank you for sharing your insights and I look forward to reading your post! Hi Kristine thanks for stopping by. I look forward to reading your blog. I’ll have to hop on over later today. My six year old son sometimes acts like a baby. One day I realized that I needed to tell him up front. “Justin you are not my baby anymore.” His eyes had tears and my heart felt sad. That season is over. I continued to say, “Justin I need you to be a six year old. I’m ready to do six year old things now with you.” He smiled and I felt still sad. Our relationship has changed though. I took him putt-putt golfing and bowling. I like having a six year old. As we did these things. I gently said. “I am so glad you are six now so that we can do things like this.” Now if we can just get him to have more confidence with his reading. Thanks for your comment. I just couldn’t help myself. I had to share this. I love when others comment. It always gets me to thinking about what I want to writer about next. This is another wonderful story, Abby. I remember those reading times too! My daughter has dyslexia, and teaching her to read took two years and every method I could get my hands on. (Sounding it out did NOT work!) Thanks for this encouragement to stay the course! Over time, the investment pays off. And yes to letting them make mistakes. I’m with Dianne up there, it’s kind of nerve wracking when they’re teens, but I’m trying my best to step back and hand over some control. 🙂 Hi Lisa, thanks for featuring Abby today. Yes, I can already tell I’m going to have to try some new methods with my youngest son. He is so different than my oldest and just getting him to sit still for five minutes is a challenge. Always love hearing your insights, Betsy. Betsy thanks so much for stopping by. I just have to share something here. I struggled with dyslexia when I was growing up. Everyone encouraged me and helped me. It was so hard. I love reading now!!!!! I appreciate great blogs, books, and writing. I’m so glad that God sent people into my life to help me. I just love my parents for encouraging me to keep on trying when I wanted to crawl under a rock and cry. Reading is truly a gift. I don’t take it for granted at all. Jumping over from Jennifer Lee’s link up. My two teenagers are a testimony that what you say here is true. There were so many occasions when I wanted to fix or shield them from failing but eventually I began to see that adversity is what cultivates hopefulness. And hope is what moves us forward into life’s calling. Lovely reflection you’ve written here. Hope is what moves us forward to life’s calling. Amen to that, Shelly! Thanks so much for stopping here today. It is always lovely to hear from moms who are further down the road. Shelly nicely said, “adversity is what cultivates hopefulness. And hope is what moves us forward into life’s calling.” Justin my six year old loves stories. I keep encouraging him that he will be able to read on his own. He is hopeful. I can see in his eyes when older kids read to him that he wants to do it too. Thanks Shelly for stopping by today!!! Stay the course. Yes, I’m learning this is true even with teenagers. What a sweet story, Abby. I could picture your son reading with character voices…and loved every minute of it. 🙂 Your words were beautiful encouragement. Kristi thanks for stopping by today. Isn’t wonderful to have writers like Abby who are so encouraging with their words. It brings tears to my eyes when Abby shared about her son reading with character voices. Thanks Sara for coming by. Yes this parenting thing is tough and I agree it’s worth it.!! !